The activation of your product is very important, as it allows access to Technical Support, download of the latest version of the antivirus and daily updates during the license period of your Panda. The activation of Panda is integrated in the installation process. Nonetheless, sometimes the automatic activation may fail.This article explains how to solve this issue. 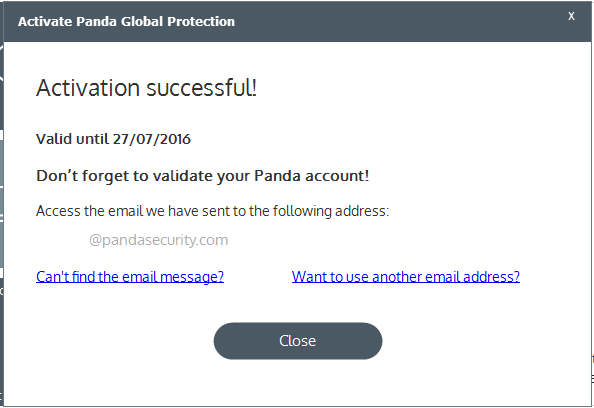 Every time you access Panda, a window prompting to enter the activation code is displayed. To solve this issue, you need to enter the Activation Code in the text box and follow the wizard through. Enter your Activation Code on the previous window and click Next. The activation progress will be displayed. Once activated, click Finish to close activation wizard.